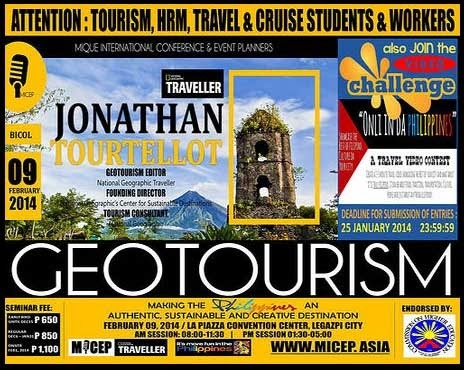 National Geographic Traveller Magazine's Jonathan Tourtellot will be at La Piazza Convention Center in Legazpi City tomorrow, February 9, to speak about geotourism. Tourtellot, who previously worked with the United States Travel Association on a landmark survey of Americal traveller behavior and tourism sustainability, will share his thoughts about making the Philippines an authentic, sustainable and creative destination. His focus will be on geotourism, a word that the consultant, editor and journalist himself coined, to refer to "tourism that sustains or enhances the geographical character of a place—its environment, culture, aesthetics, heritage, and the well-being of its residents." Among the invited participants are tourism, hotel and restaurant management, and travel and cruise students and workers. Legazpi City was selected as one of the three cities in the country in which said seminar-workshop will be held. The other two are Quezon City and Baguio City. Co-presenting the event are Mique International Conference & Event Planners-Asia (MICEP) and National Geographic Traveller in partnership with the Department of Tourism (DOT). Said event is also endorsed by the Commission on Higher Education (CHEd) Regional Office V.
Interested participants may register online at MICEP's website.